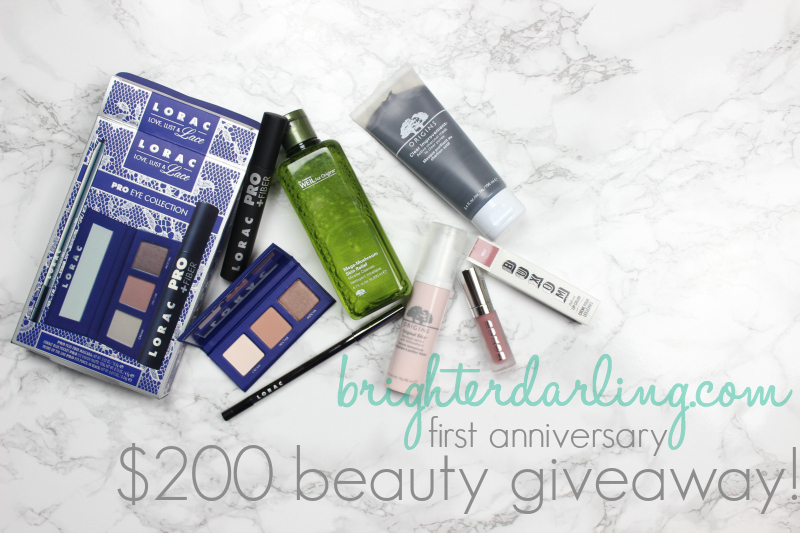 Well, it’s officially been one year since I started Brighter, Darling last January and I’m celebrating with a beauty giveaway! I’ve had some form of a blog since 2008 – originally, it was about my comical dating adventures as a single girl in Philly, then it slowly segued into beauty, gluten free food and life and now I have narrowed my niche, created focus with what I’m most passionate about and also created an actual business plan with branding to help set some goals, measure my metrics and expand my reach/engagement. 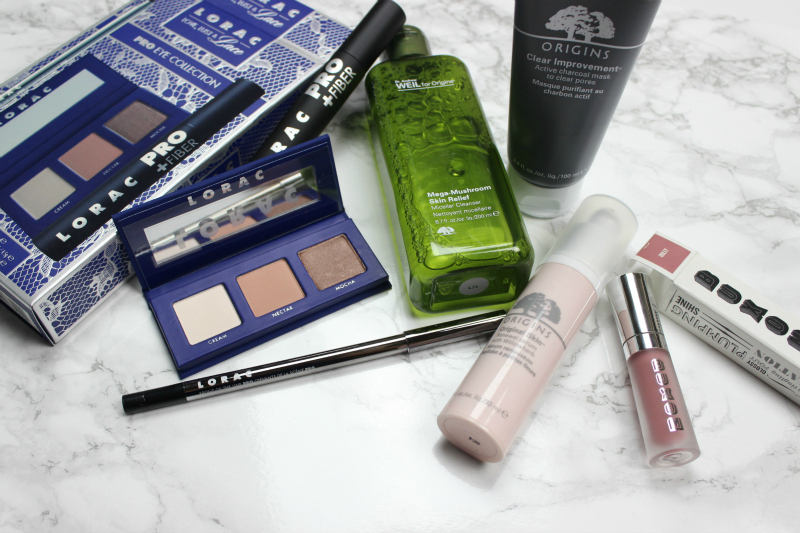 Enough about all that though, you’re really here to enter my beauty giveaway valued at over $200 full of goodies I hand-selected! Each of these brands have been featured on my blog at some point and they’re high-quality products that I hope will make you feel beautiful. I included a full size toner, serum and mask by Origins to give you a nice starting base, then we have a perfect everyday eyeshadow palette with a bulletproof full size black eyeliner, a thickening/lengthening full size mascara by Lorac and you’ll finish off the look with a natural rose-hued plumping lip gloss by one of my favorite brands, Buxom. All of these items combined have a retail value of over $200. ORIGINS Mega-Mushroom Skin Relief Micellar Cleanser – Micellar water made a big impact in 2015! It’s a liquid cleanser that can be used as a toner or makeup remover. Apply to a cotton pad and gently wipe all traces of makeup off – from foundation to mascara, or use as a toner after cleansing. This no rinse, soap and alcohol free formula is suitable for all skin types. ORIGINS Original Skin Serum – This serum is targeted for those whose skin seems to be hitting a “quarter life crisis.” Starting to see more visible pores, fine lines, losing a slight bit of glow? This is for you. Smoothes roughness, dullness and helps minimize pores with several natural ingredients. ORIGINS Clear Improvement Active Charcoal Mask – A must-have for congested skin or times when you’re dealing with breakouts, charoal helps draw out impurities, leaving your skin tighter and brighter over time. LORAC Love, Lust & Lace PRO Eye Collection ($100 value) – Lorac eyeshadows are one of the best in the industry for pigment, blendability and texture. This trio is perfect for any skin tone or eye color and is excellent for every day use. Beginners and pros alike will enjoy this simple packaging and portability. I loved that there was nothing too dark or too light in this palette. The liner is impossibly budgeproof – I tried the tester on my hand. A true, dark black with a creamy texture will apply easily to your lash lines. The mascara is dramatic, but layerable. See it used on YouTube here. BUXOM Lip Cream, Dolly (mini) – I have talked about loving the Buxom glosses on the blog before, so I wanted to include this super neutral-light rose shade to complete the entire look. Buxom glosses are long-lasting, plumping and have a mild, sweet mint taste. I can’t wait to see what Brighter, Darling Year Two brings! Thank you for being my readers and followers on social media – it really makes me so happy to write about something I love and help others feel their best through my experiences. "Happy Holidays! | Be back Jan. 4, 2016"